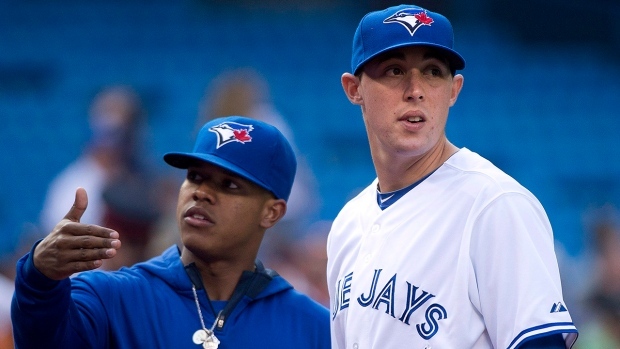 TSN Baseball Insider Steve Phillips believes that Marcus Stroman and Aaron Sanchez may not be long for the rebuilding Toronto Blue Jays. Stroman, who was named the team's opening day starter last week, sounded off in February on the team not offering him a long-term contract extension. He's under team control through next season, while Sanchez, who's been limited to just 28 starts over the past two seasons, is under team control through 2021. Phillips told First Up on TSN Radio 1050 Toronto on Monday that even if Stroman and Sanchez pitch well this season, the Blue Jays are unlikely to be in position to compete for a playoff spot and he believes they would be best off dealing the two starters. TSN baseball analyst Steve Phillips joins First Up with Michael and Carlo to discuss Blue Jays spring training, the home opener, lack of ticket sales, the possibility of trading Marcus Stroman and Aaron Sanchez, Devon Travis' injury and more. "I don't think this year [the Blue Jays are] going to be as competitive and I think that the best thing for the Blue Jays, and best thing for Stroman and Sanchez, is that those two guys pitch well," Phillips said. "Because then it opens up the door to a multitude of options. If they pitch well, then the organization can consider signing them to an extension and the players get a payday. If they pitch well and the Jays decide we're not going to lock them up, we're going to trade them, then the players get traded to a team that's probably in a pennant race that may have some financial flexibility that may give them that sort of payday in the future. So, I think it opens up doors for both sides. "Even if Stroman is great in that first four months, he's also been the guy that had a 5.5 ERA last year. He's been the guy that's had some shoulder issues and I just don't see that he is a long-term part of it. And for Sanchez, as well, it's hard to see where a deal would make sense because he's been hurt so much that, unless it's a bargain basement for the team, they probably don't make the deal and Sanchez probably waits and plays it out too. So I think probably both get traded." Stroman, who will turn 28 on May 1, posted a 4-9 record last season with a career-worst 5.54 ERA in 19 starts. He went 13-9 in 2017 with a 3.09 ERA over 201 innings. Sanchez, 26, had a 4-6 record last season with a 4.89 ERA. He appeared in only eight games in 2017 due to a blister after a breakout 2016 campaign in which he went 15-2 with 3.00 ERA and was named to the All-Star Game.